Manta Rings is a four-player minigame in Mario Party 4. Its name comes from "manta rays". 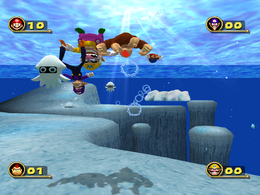 From underwater, the four players are seen on a dock above. They jump in the water and turn around, ready to swim. The object of the mini-game is to swim through as many Bubble Rings as possible. The game is seen from a rear view perspective. The Bubble Rings appear as the four players swim through the course. Each bubble ring is worth one point. Sometimes, a Manta Ray will swim by and drop three gold rings worth three points each. Hitting a Blooper will deduct one point, hitting Sushi will deduct two points, and hitting the orange eel at the end will deduct three points. The players will swim through a goal at the end, and the scene changes to show them above the water. The winner will jump onto Toad's boat and do a winning pose. If more than one person wins, they will stay in the water and wave. If all players have the same exact number, however, Toad will instead drive away, leaving all four characters stranded in the water, resulting in a draw. Rules – "Dive through the rings while swimming in the ocean. Each ring is worth one point. If any enemies hit you, you'll lose points." Advice – "The gold Manta rings are worth three points, so try to grab as many gold ones as you can!" This page was last edited on October 7, 2018, at 20:45.